If you are looking for information on the Amazing Athletes franchise business opportunity, Amazing Athlete franchises or Amazing Athletes franchising, then you have come to the right place. Amazing Athletes, Inc. has a mission to enhance the basic fundamentals of sport physical fitness, hand eye coordination and gross motor skills for the youth of today. We began as a small company in 2002 located in seven schools in the Orange County area. Amazing Athletes' Sport and Fitness program is now taught in over 125 schools throughout California. We feel our program is the best available and we are confident that the Amazing Athletes experience will teach your child the fundamentals of the future. 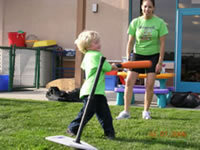 The Amazing Athletes Program is designed around the child having a complete experience. Gross motor skills, two ball sports, muscle tone, physical fitness and various activities which enhance hand eye coordination and brain development are compiled into one action packed 35 min class, making it a fun and positive learning experience. 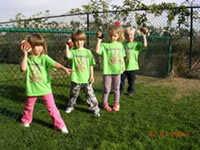 Our ball sports class offers the child a variety of sports namely soccer, hockey, football, basketball, baseball, volleyball and golf. Amazing Athletes is based on a building block system starting with the basic fundamentals of each sport working toward well-developed skills and games. Each sport is carefully broken down so the child understands all the basic elements. 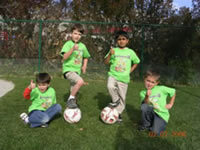 Our instructors teach an age appropriate curriculum. Our program not only teaches 7 different ball sports, we also incorporate many gross motor skills each individual child should know or be taught by kindergarten. Our program helps with musculoskeletal development in order to strengthen and gain control over the larger muscles in your child's body used for running, jumping, skipping hopping, galloping and throwing. We use cognitive development in our program, which helps with distinguishing colors, counting, sharing and learning how to follow direction. Our staff are fully qualified with Fingerprint clearance, insurance and TB test. Our program is unique and is only available to certain preschools and community centers, and not to the public. Our program also helps teaches self-confidence because children always under estimate their own abilities. As a company we strive for excellence with the children, parents and schools. We know as a prospective franchisee your major concern is security for your investment. Let us put your mind at ease. An Amazing Athletes Franchise can be both an exciting and profitable business. A successful franchise business can be truly rewarding, but the first step, the decision on the right franchise for your investment, is crucial. A very important benefit of our Franchise Package is our exceptional Training Program. That's why Amazing Athletes, Inc. offers a comprehensive training program to our franchisees. Included in the program are both classroom and hands-on training in valuable areas such as: teaching methods, promotional activities, customer service, administrative duties, as well as problem solving. If you like being in an exciting specialty educational environment and have the ambition and desire to succeed as a business owner, an Amazing Athletes franchise may be right for you!